70-year-old Maria receives a cancer diagnosis that makes her question how she wants to die. Unfolding through a series of short scenes with Maria’s much younger lover, song-and-dance numbers with her nurse, stand up routines from Maria’s daughter, and missives from a Sea Shepherd Conservation team volunteer at sea, Graceful Exit is a darkly comedic play that asks “Who controls your death?” Conceived and written by Alanna Coby, with direction by Megan Hanley, music by Sean Vigneau-Britt, and developed in collaboration with ensemble theatre company, The Syndicate. A trans-media adaptation of Jean Genet’s play, The Balcony. The residency will be used to develop a performance script through devised physical theatre techniques, music, filmmaking, and social media. The goal for the residency is to create a fully developed script with a small company of artists consisting of a composer, designers, actors, and filmmakers. A band of pretend scientists perform research to early 80s music while pontificating on the nature of reality, humanity, and the on and the off. Meditation Zero takes a stab at ruminating on what Freud would recognize as the Death Drive, but which I am reframing as the cyborg situation. With devising support from Karen Kandel and Gregory Schott. Performed by Anthony Napoletano, Hannah Schilsky, Kate Brehm, and friends. An exploded version of all things Jane Austen that engages audiences in thinking about gender and class. We are stealing this iconic piece of heterosexual Western culture, appropriating it for the queer world, and using it to indulge and undermine the structures it is used to uphold. We aim to claim the characters who champion rigid gender roles for the darkness; after all, what is more queer than the self aware performance of gender? By recreating a black debutante ball as an immersive theatrical event, this project will explore the history and language of “presenting” black female bodies. A company of black female artists will use music, movement, and text to transform a coming-of-age ritual into a personal and political piece of theatre. On a spaceship orbiting an unusual planet, a team of scientists attempts to understand a vast and terrifying alien intelligence. This original theater piece will immerse the audience in a tense and unsettling world, using dance, physical theater, and an endlessly reconfigurable playing space. Following up on its acclaimed 2008 production There Will Come Soft Rains, Sinking Ship Productions continues its exploration of science fiction on stage. A theatrical fugue for two actors that loops until every audience member, at their own will, leaves the theater. The piece explores lost memories, spaces that live around us like invisible visitors, the cycle of conception-birth-growth-decay-death-and-decomposition, the division of the sexes, and a binary physicality of angles and curves. Directed by Nicolas Noreña and created with Timothy Scott and Erin Mullin. “The Kindness Project” examines the evolution, good or bad, of “kindness” in early 20th century and today’s China. The piece is loosely based on interviews with people from different generations. The ensemble uses different devices to explore how the change of kindness affects traditional value, belief system and daily human interactions. “The Kindness Project” ensemble: Esther Chen, Shan Y Chuang, Chongren Fan, Qihao Huang, and Paul David Miller. Taken from a years worth of sleeptalk recordings, Some Must Watch While Some Must Sleep imagines what would happen if your ‘waking self’ and ‘sleeping self’ met, conversed, and maybe even healed. 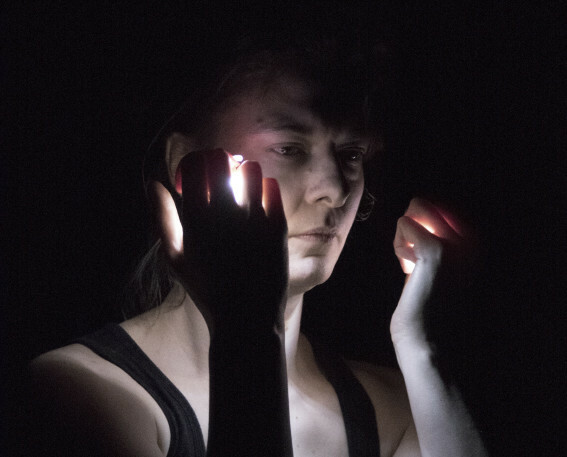 A chamber work for two performers and an iPhone, the piece is inspired by TedTalks and seances, inviting you to contemplate the dreaming world through the verbatim transcripts of a sleeptalker. Some Must Watch While Some Must Sleep is written and performed by Tanya Marquardt alongside performer Barra Levy-Mazie, directed by Ellie Heyman, choreographed by Stephen O’Connell, and dramaturge by DD Kugler, with lighting design by Emma Riveria, and sound design by Omar Zubair. Click here to view an excerpt from Some Must Watch While Some Must Sleep at BAX. This program is made possible through generous funding by the Jerome Foundation and with public funds from the City of New York, Department of Cultural Affairs and Materials for the Arts. Thanks also to the Greater Jamaica Development Corporation, Chapel of the Sisters, for supplying a space for these artists to work.